The investor appetite for gold has been in the doldrums in recent months. Rate hikes, low inflation, rising equity markets and a strong USD have significantly diminished the appeal of gold. However, these factors may be starting to turn. The fall in gold prices also could invigorate a pick-up in physical demand. Overall we see gold prices stabilising at current levels, with the probability of a short covering rally increasing substantially. The normal drivers of investor demand have been battered by the severity of the macro issues. So much so that the USD become the safe-haven asset of preference. When combined with strong economic data in the US and the subsequent rise in equity markets, investors have dumped gold. Outflows from gold-backed ETFs have surged, while consumer demand stagnated. Gold’s rallies have been eventful trading sessions in the recent past to wrap-up 2018 (almost over 4.77% spike in the last month), gold price in the major trend has gone into the consolidation phase. The above nutshell runs us through the monthly and turnover ratio is annualized (monthly trading volume annualised divided by the amount outstanding). UST cash are primary dealer transactions in all US government securities. UST futures are from Bloomberg. JGBs are OTC volumes in all Japanese government securities. Bunds, Gold, Oil and Copper are futures. Gold includes Gold ETFs. Min-Max chart is based on Turnover ratio. For Bunds and Commodities, futures trading volumes are used while the outstanding amount is proxied by open interest. The diamond reflects the latest turnover observation. The thin blue line marks the distance between the min and max for the complete time series since Jan-2005 onwards. Y/Y change is change in YTD notional volumes over the same period last year. 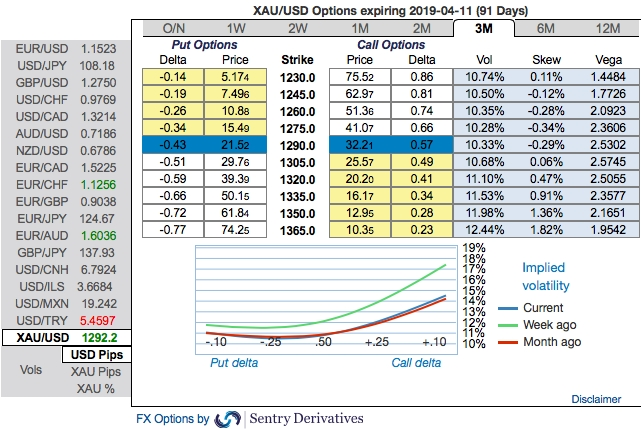 OTC Gold updates (XAUSUD): Bullish neutral risk reversals are observed in gold’s OTC hedging market, while positively skewed IVs of 3m XAUUSD options have been stretched out on either side but bullish bias. This is interpreted as the mounting hedgers’ interests for OTM calls options. Well, on hedging grounds, keeping topsy-turvy underlying sentiment under consideration, 3-way straddles versus OTM puts are advocated for gold’s price risks, while the strategy comprises of at the money +0.51 delta call and at the money -0.49 delta put options of 1m tenors at net debit with a view of arresting potential FX risks on either side. On trading perspective, bidding bullish neutral risk reversals, buying (1%) in the money gold call options are advocated, an in the money call with a very strong delta would move in tandem with the underlying XAUUSD move. Currency Strength Index: FxWirePro's hourly USD spot index is inching towards -80 levels (which is bearish), while articulating (at 13:26 GMT).